The largest state-controlled Russian banks significantly increased the salaries of top executives in the first half of 2013, according to slon.ru. 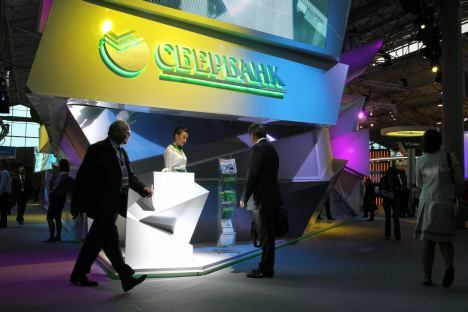 Sberbank Rossii, according to its quarterly report, paid the members of its executive board 208.3 million roubles (around $6.3 million), compared with 181.1million roubles last year. The Board of Directors of the bank consisted of 14 people at the end of the second quarter of 2013. The other two largest Russian banks proved to be even more generous. VTB24 increased compensation paid to the board, which consists of nine people, by 5.8 times, up to 1.589 billion roubles versus 274.5 million roubles it paid a year ago. Gazprombank, which ranks third in assets in the Russian Federation, increased payments to members of its board (approximately 20 people) by five times – up to 1.06 billion roubles. Judging by quarterly reports, the increase in the payments is due in part to bonuses paid for work done in 2012. The board's salary in the first half of the year amounted to 194.4 million roubles, benefits and compensation were 5.4 million. As the publication noted, VTB24's quarterly reports show that the net profits of the bank (using Russian Accounting Standards) declined by almost 40 percent in annual terms - from 16.6 billion roubles to 10.35 billion roubles. Gazprombank had an even more noticeable drop in net profits in the first half of the year; seeing them decline by 57 percent (from 20.45 billion roubles to 11.74 billion roubles for the same period last year). Sberbank didn't post a significant decline in net profits, however, they grew only by 4.8 percent. He said the ministry will revise the forecast for the upcoming three-year budget and the long-term forecast. “I think in all of these reports we will have to estimate future rates of economic growth more conservatively, and take into account the prospects for global growth and our competitiveness,” said the minister. The ministry forecasts industry growth to slow down to 2 percent from 2.6 percent in 2012, however, already by 2014 the Ministry of Economic Development predicts an acceleration in industry up to 3.4 percent. The International Monetary Fund, however, has already lowered its forecast of Russia's GDP growth from 3.4 percent (as in 2012) to 2.5 percent. At the beginning of July Russia's Minister of Finance Anton Siluanov stated that Russia was having problems with its budget. Already by 2013, revenues may be as much as 1 trillion roubles behind budget (1.6 percent of GDP). The government is preparing to patch the budgetary holes at the expense of medicine and education, while increasing spending on defence, infrastructure, and sports projects. In the meantime, according to the state statistics service, industrial production in the Russian Federation resumed its decline. In July 2013 the rate was 0.7 percent; industry showed zero growth for seven months as compared to 3.2 percent one year earlier.